I held a class last Thursday for 30 cards out of the Polka Dot Simply Scrappin' kit from the Summer Mini. We used 1/2 kit to make 30 cards. There were 8 ladies here so 240 cards got made that night! Here are a couple of the cards they made. I love the colors in this kit! So fun and bright! I got some of my new catalog goodies on Friday! I have been just playing around with some of the new toys so far. I'm hoping to have something I created with those new goodies soon. What do you do when the mojo goes missing? For me, I like to CASE other people's cards, do a sketch challenge, a color challenge or all of the above. I started CASEing someone's card and ended going in an entirely different direction. But I had my starting point and that's what counts! I seem to be hung up on the this Fabulous Florets set. I'm just having so much fun with it! I have told my customers that stamping is liking a muscle. The more often you use it the better it works. I haven't been using my stamping muscle as much as I would like to lately and I'm getting out of shape! The ideas aren't flowing as they should. Since going back to work full-time last fall I have been working hard to find that life balance. I started a job I really love in early May and the schedule should help me a bit. If soccer season hadn't kicked in for my 13 year old. Most nights we are running the boys to gymnastics and soccer or both. Then there are those out of town tournaments. Both of my stamp clubs are on hiatus for the Summer. I find I need a purpose to stamp and I love the challenge that coming up with awesome club projects gives me. Since I don't have that focus this Summer I must cast my efforts to something else. Classes. I have been meaning to offer more of these this year but there was that whole life balance thing I mentioned. So now I have a challenge set before me to offer classes this Summer. And for the first time in several years I am going to the Stampin' Up! convention! I am so excited! This will give me the kick in the pants that I need. The new Stampin' Up! catalog comes out July 1 too! Stampin' Up! demonstrators will get to pre-order a sampling of new product June 1. Now there will be swaps to prepare, classes to create, and fun new stamping toys to play with! 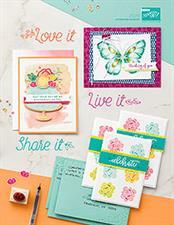 All this to say, I will be flooding my blog with new stamping projects to inspire you! I'm going to fit a little me time in to my day, my week, my life to bring back that stamping glow I so love. This weekend I spent a wee bit of time in my craft room and have this pretty little flower card to share featuring the "Fabulous Florets" stamp set from the Summer mini. I made up a quick blossom card with the new Fabulous Florets set from the Summer mini. Hello, sad, neglected blog. Life has been too busy to update you. But I'm here to tell you I've been thinking about you a lot and I finally have a little bit of time to post! I had my monthly stamp club this past Thursday and we made projects using lots of new things from the Summer mini. 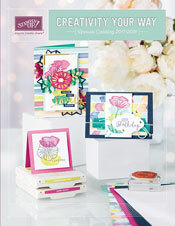 This card uses the new Pretty Postage stamp set and the coordinating postage punch. I stamped the image with Jet Black Stazon ink on Watercolor paper and then watercolored the image with watercolor crayons and my aquapainter. The final touch was to add crystal effects on the berries. You can't really see that in the photo but it adds that wow factor. I will be back to post the other two projects we made. Thanks for stopping by!